“Home care” encompasses a wide array of services but – at its core – involves aides, therapists, and nurses providing assistance and care in a client’s residence. Depending on the situation, a person may need help around-the-clock, once a day, or for just a few hours a week. For instance, some people use home care briefly to recover from an injury or a hospitalization. Others use it to supplement services from assisted living or retirement communities. Still others use it to remain healthy and independent at home, despite chronic illness or the gradual diminishment of capabilities that come with aging. Why Should I Choose An Agency Over A Direct Hire? Employer Obligations: By hiring an aide or nurse directly, you take on the legal responsibilities of an employer, including paying payroll taxes, workers compensation, and unemployment insurance. Working with a Home Care Agency alleviates you of these responsibilities. Peace-of-Mind: The only background checks that come with a direct hire are those you conduct yourself. Home care agencies are required to conduct criminal background checks and screen their employees. Security & Contingency: If your direct hire harms you, you’re on your own. In contrast, home care agencies are required to carry various forms of insurance to protect you. They can also quickly provide a replacement if your aide or nurse is sick, injured, or changes jobs. Training & Supervision: As with background checks, you’re responsible for training and supervising your direct hire. Agencies, however, have the experience, knowledge, and resources to ensure their workers are thoroughly trained in any services or tasks they perform, including safe infection control, falls prevention, emergency preparation, and personal care tasks. Before looking for an agency, you should determine what kind of care you need. Do you need skilled care provided by a registered nurse? How about hands-on personal care services, such as help with bathing and dressing? Are there cognitive or mental health issues that need to be addressed? Does your home need to be made safer and more accessible? How often – and for how long – do you expect to need care? Home care agencies have staff with expertise in assessing client needs and developing plans of care, usually at no charge. These professionals can also help you negotiate the maze of care resources and effectively communicate your needs to physicians, hospital staff, and nursing home managers. They can also help emotionally resistant clients understand and accept services. Depending on the scope of need, you may also want to work with an independent Geriatric Care Manager (GCM). These trained professionals – most often nurses or social workers – can help assess needs, find resources, and monitor services. Some agencies have GCMs on staff or have established relationship with reputable GCMs in their communities. You can find a list of GCMs at www.gcmnewengland.org. The state’s Aging Service Access Point (ASAP) network is also a good resource. ASAPs are publicly-funded, local agencies that provide information and referrals for a range of elder services. You can find the ASAP nearest you by calling (800) AGE-INFO or visiting www.800ageinfo.com. Paying Privately – i.e., out-of-pocket – is a simple, affordable, and flexible option used by thousands of Bay Staters. More than 100 agencies in Massachusetts provide private care services. Commercial health insurance policies typically cover some home care services when a person is recovering from surgery or illness, generally with a cost-sharing provision. Call your insurer’s customer service department to get details on requirements, benefits, co-payments, and deductibles. Long-term care insurance policies almost always cover home care as an alternative to nursing homes. Check your policy, since the benefits under these policies vary greatly and are usually capped at a certain dollar level per day, week, or month. Medicare covers home care for older clients who 1) cannot leave home without assistance, 2) are under a physician’s care, and 3) require skilled nursing/therapy. Medicaid (Masshealth) operates under similar requirements for low-income clients. The Massachusetts Home Care Program provides state-funded, non-medical services to elderly and disabled individuals who meet financial guidelines. Call (800) AGE-INFO for more information. The Veterans Administration (VA) pays for home care services for veterans who are at least 50% disabled due to a service-related condition. A physician must authorize these services, which must be delivered through the VA's network; it only covers medical services. Unlike most states, Massachusetts does not offer a specific license for private pay home care agencies. Since 2010, however, the Alliance has offered an Accreditation program with similar standards to licensure in most other states, both to establish quality standards within the industry, and to help consumers make informed choices. The program includes fifteen standards relating to: client rights, privacy, and complaint procedures; protections against abuse; fair employment practices; caregiver background screening; competency, training and supervision; insurance coverage; and compliance with all applicable federal, state & local laws. To become Accredited, agencies must present documentation to the Alliance; these documents are then carefully reviewed by Alliance staff for proof of compliance. Accreditation is only awarded to agencies that meet or exceed all fifteen standards. Accreditation is not the only indicator of an agency’s competence. All Medicare certified agencies, for instance, have met strict standards established by the federal government. Organizations such as JCAHO and CHAP also offer certifications to home care agencies. Medicare certified agencies are listed in an online tool called Home Health Compare where any person interested in learning about the agencies in their area can search by zip code or by agency name to compare quality measures. Consumers can compare up to three agencies at a time and also weigh those statistics against the state and national averages for the listed quality measures. 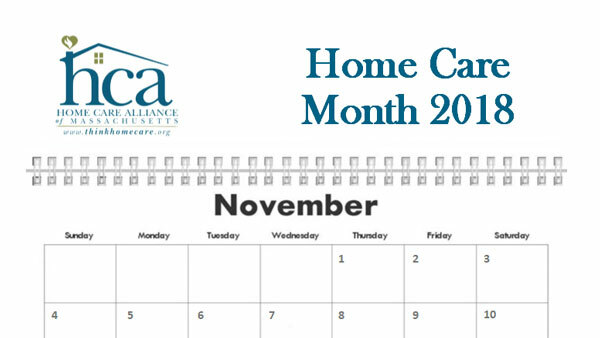 Under “celebrate and raise awareness,” put that we’ll be doing a “home care fact of the day” every day in November on our Facebook page. And ask people to follow that, twitter and our blog. 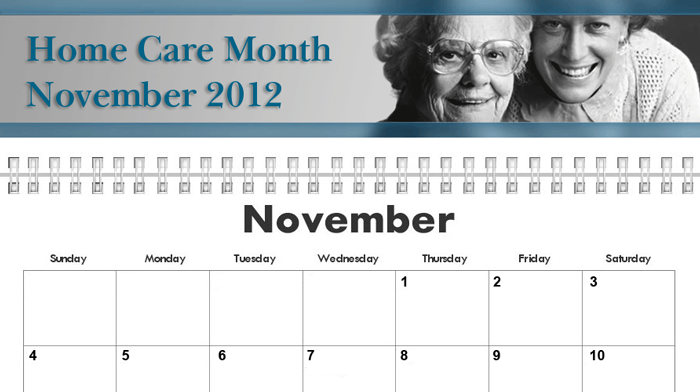 To learn more, visit www.thinkhomecare.org/accreditation. Has the agency been reviewed by an independent organization, such as Mass Dept. of Health, JCAHO, CHAP or the Home Care Alliance of Massachusetts? If so, will they provide you with evidence of their accreditation/certification from that organization? Does the agency have literature describing its services, fees, and billing process? If so, will they send you copies? Does the agency work with the client and family to develop a written plan of care or service contract? If so, how often is it updated? Does the agency directly employ its workers, or are they considered independent contractors? (They should be directly employed). Does the agency pay workers’ compensation insurance and payroll taxes for its workers? Does the agency provide a written explanation of client & family rights? Does the agency educate family members about the care they provide? Are agency caregivers and supervisors – including backup caregivers – available 24 hours a day, 7 days a week? How does the agency investigate complaints and/or resolve conflicts between agency staff and clients? Does the agency have professional & general liability insurance?